Even the most unimaginative, PS2-obsessed kid in the world couldn’t fail to be inspired by it. And if there was an award for National Trust property that goes all out to inspire children, I think Bodiam might win it. But more of that later. First, the scones. 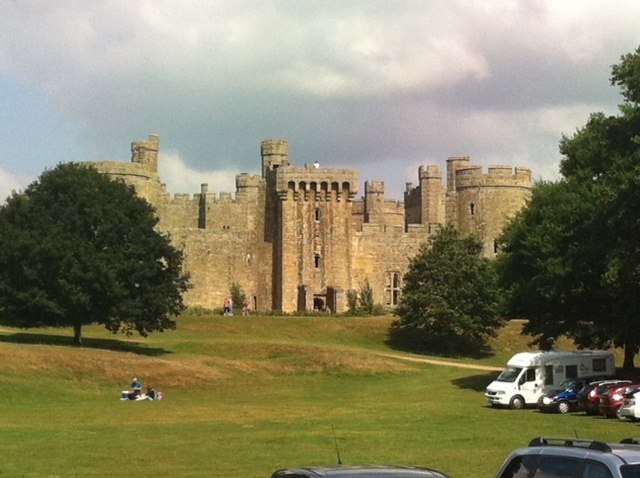 It was clear to me from the car park that Bodiam is very good at being a castle. But let me tell you now that Bodiam is very, very good at scones. In fact they were so good that I’m going to give them my first FIVE OUT OF FIVE. I may regret this once I’ve tried a few more (this is only my third visit after all) but my independent adjudicator (aka my other half) agreed with this score and he’s not a man that is easily impressed, unless he’s at a Cirque du Soleil performance and then he is unfathomably impressed by things I will never comprehend. But I digress: the scones were lovely. My dream scone is a warm scone. And although the Bodiam scones weren’t warm they had that lovely soft, melt in the mouth texture that you get from a warm scone. Even better, a pre-plated cream tea consisted of one fruit scone and one plain scone. I realised it is impossible to say that one is better than the other: they’re just different. And at Bodiam they’re both excellent. Bravo, Bodiam scone maker. The castle itself is stupendous. I think it’s the moat that does it – you walk across a little bridge and into the ruined castle, where you have to really use your imagination to picture what it must have been like in the 1300s and 1400s. But from outside you can see how formidable it must have looked. And that leads me to the big debate about Bodiam. Sir Edward Dalyngrigge was given permission to build it in 1385, when Richard II gave him ‘license to crenellate’. If you look up at a battlement on a castle and see the bits cut out like missing teeth (where they fired arrows and poured boiling tar from) they are known as crenels. By ‘crenellating’ his home, Edward was building a fortress that could help defend the realm, and it was a very real threat in those days, both from external forces like the pesky French or from internal insurgents, like the pesky peasants and their pesky revolt. However, a lot of people question Dalyngrigge’s motives and suggest that defensively Bodiam wasn’t all that; what he really wanted to do was make people think he was a bit special. Well, I don’t really care – it’s still a beautiful castle in a stunning location. Inside the castle there are all sorts of exhibits, such as a man making arrows and another making armour, to help you imagine what life was like in those days. The man making armour was moaning about his bellows not working properly – I couldn’t work out if it was part of a performance or not. But what I really loved about Bodiam was the effort they make in bringing the medieval era to life for children. They had archery and cannons and a really brilliant display of a trebuchet – a woman explained how the trebuchet worked and then fired it into the moat (“we just need to wait for the ducks to get out of the way” she said, matter-of-factly). I was seriously impressed, so for a little knight-obsessed kid it would have been off-the-scale exciting. I do now have one new ambition in life, though, and that is to see a little girl in a shop insisting on having a knight’s outfit instead of the usual pink frock and pointy cone hat thing. That would be really awesome. I'm not sure we'll make the hat-trick this Bank Holiday weekend - yesterday's visit to Ham House and today have proved a tad exhausting. But keep tweeting your suggestions for my next visit. Bodiam Castle: 4 out of 5. Loved the trebuchet.